Entitlements and immigration finally got their moments in the third and final presidential debate Wednesday night. Moderator Chris Wallace largely kept the candidates to the six issues that had been decided on as topics for the evening: entitlements and debt, foreign policy, the economy, immigration, the Supreme Court and each candidates' fitness to serve as president. Hillary Clinton and Donald Trump had largely ignored some of the topics in previous debates, choosing instead to focus on others and trade personal attacks against each other. While questions of character still got more time than any other subject, the Fox News anchor kept a firm hand and held the candidates close to the planned topics. Most pundits are focusing on the zingers of the evening: Clinton questioning the Trump Foundation's purchase of a 6-foot portrait of the Donald — emphatically saying "Who does that?" — and Trump's interjection of "such a nasty woman" during one of Clinton's responses. But that comment is less interesting than the answer that he was interrupting — a discussion of how the country should deal with costly entitlements. Toward the end of the contentious debate, moderator Chris Wallace asked the candidates whether they'd be willing to consider a "grand bargain" that would include both tax increases and benefit cuts to preserve both Social Security and Medicare. The most recent estimates show that unless steps are taken, the Social Security Trust Fund will run out in 2034. Trump ignored Wallace's question on the federal programs, instead repeating his criticisms of the Affordable Care Act. He repeated claims that premiums will rise in 2017 by "60 percent, 70 percent, 80 percent" and that the law is "destroying our country." A recent study from the McKinsey Center for U.S. Health System Reform suggested premiums will rise an average of 11 percent for those looking for the best deal next year, according to The New York Times. "We have to repeal and replace Obamacare," Trump said. Clinton responded to Wallace saying that adding to the Social Security Trust Fund was part of her plan to raise income taxes on the wealthy. Social Security taxes on the wealthy are already rising: The Social Security Administration announced recently that the maximum amount of income subject to Social Security taxes will climb 7.3 percent, to $127,200 in 2017. "I will not cut benefits," she said. "I want to enhance benefits for low-income workers and for women who have been disadvantaged by the current Social Security system." "I have been for border security for years." The lack of focus on immigration in previous debates was striking, especially as it's played such large role in the campaign. Trump launched his candidacy last year in a fiery speech in which he called Mexican immigrants "rapists" before adding "and some, I assume, are good people." Clinton has used that clip — and others like it — to galvanize support among Latinos and to further attack Trump's character. Clinton continued that line of attack Wednesday, saying that Trump's plan to deport 15 million undocumented immigrants would "rip our country apart." "I have been for border security for years," she said. "But I want to put our resources where I think they're most needed: getting rid of any violent person." On Wednesday, Trump repeated his desire for "strong borders" and accused Clinton of wanting "to give amnesty." He also opened a fresh line of attack on the president, saying that Obama has been deporting "millions" of people. "Nobody knows about it, nobody talks about it," he said. "She doesn't want to say that, but that's what's happened, and that's what happened big league." While "millions" is an exaggeration, the country has increased its deporting efforts in recent years to a high of 435,000 in 2013, according to government data cited by the Pew Research Center. Of course, that doesn't normalize the data based on how many illegal immigrants are entering the country, so the figure could be a lot lower. There's also issues of defining "deportation," which the Washington Post outlined under the clever headline "Lies, damned lies and Obama's deportation statistics." Still, the candidates weren't able to discuss all the topics the winner will have to grapple with in the White House. Many commentators complained that global warming was not brought up in any of the three debates. Other ongoing issues like fracking, capital gains and estate taxes, and the growing student loan debt crisis were also ignored. 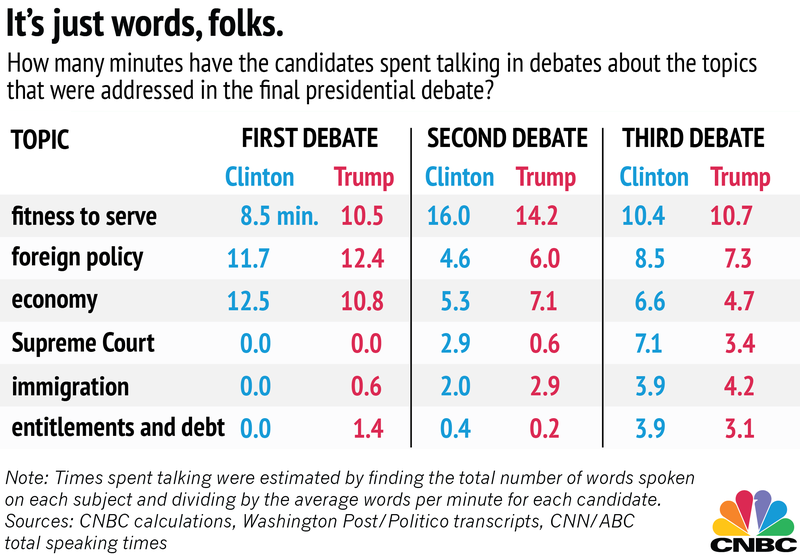 The Wall Street Journal has been tracking some of the issues the debates failed to cover.